Storing of messages of mail-enabled users. 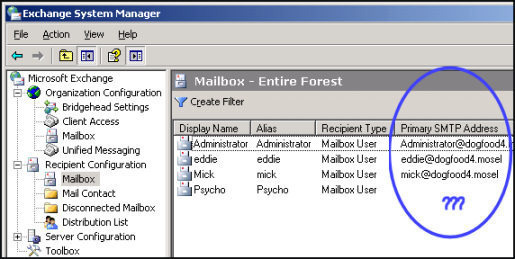 Managing the mailbox store server includes configurations and tasks performed through Exchange System Manager and standard server maintenance tasks. Public Folder server: This server stores messages and message posting in a hierarchical manner. If your system has multiple public folders, then you would have to manage and maintain multiple databases. To ensure the health of front-end servers, you have to manage and maintain the IIS metabase. You also have to monitor all connections to front-end servers. Users usually connect through HTTP or through Secure Sockets Layer (SSL). You should regularly monitor events recorded in the event logs. Bridgehead server: Bridgehead servers serve as a connection point between other Exchange servers, inside the Exchange organization or outside the organization. SMTP relay server: SMTP relay servers serve as mail gateways that relay mail between different systems. Microsoft Management Console snap-ins can be used to connect to a remote system and manage the remote system. The Microsoft Management Console (MMC) operates as the framework for system tools. It enables administrator to create specialized or custom tools which can then be utilized to delegate certain administrative tasks to users or groups. The tools can be modified, scaled up, scaled down, and customized to match your needs. A few MMC snap-ins can be used to manage local computers, and remote computers. Vendors also provide their own snap-ins that can be added to the MMC consoles. These custom tools are basically saved as MMC (.MSC) files which make it possible for it to be shared in a network folder, and sent through e-mail. There are certain tools in the Administrative Tools folder that do not work with an MMC. The Licensing program is an example of such a standalone tool. Standalone tools’ target files are executable, or .EXE and not .MSC. You can use the Computer Management console to perform management tasks on local and remote systems. Computer Management is available on client and server computers. You can use Exchange System Manager and Active Directory Users And Computers to manage the local system and a remote system. Remote Desktop For Administration: The Terminal Services service enables Remote Desktop For Administration and Remote Assistance. The Terminal Services service is automatically installed on Windows Server, and can be set up to support Remote Desktop For Administration. Through Remote Desktop For Administration, Terminal Services can be used as a management tool.Common tasks that can be performed are monitoring, print sharing, and edits to the registry. You can use the sc.exe program to manage services. The tasklist.exe program can be used if you want to view all the tasks that are running on a local computer, or remote computer. The taskkill.exe program is used to end or terminate processes on the local computer, or remote computer. Scripting with Windows Script Host (WSH): You can use Windows Script Host (WSH) to automate tasks locally or remotely. Exchange Server includes a number of scripts that can be used to configure virtual servers, and recipient polices, among other tasks. This opens a new MMC with no snap-ins. When the Add/Remove Snap-In dialog box appears, accept the default setting, Console Root, in the Snap-Ins Added To box. Click Add. A dialog box that lists all the snap-ins currently installed on the computer is displayed. You can choose a snap-in if you want to view its role. You can double-click a snap-in to add it to the console. The Add All Extensions check box is enabled by default on the Extensions tab. The snap-in you added would be displayed at the Console Root folder. You can save the console by selecting save from the Console menu. The file is then saved in the Administrative Tools folder. As mentioned previously, you can use the Computer Management console to perform management tasks on local and remote systems. Computer Management is available on client and server computers. You can also use Computer Management to connect to another computer. When you select Computer Management in the console tree, you can perform tasks such as connecting to another computer, sending console messages, and exporting information lists. System Tools, contains snap-ins such as Event Viewer, Performance Logs And Alerts, and Device Manager used for local management tasks. Storage, contains snap-ins such as Removable Storage and Disk Management for performing tasks associated with storage devices, and local disks. Service and Applications, contains snap-ins such as DHCP, DNS, and Routing and Remote Access, for server based applications. In the console tree, right-click Computer Management. Select Connect To Another Computer from the shortcut menu. When the Select Computer dialog box appears, enter the fully qualified name of the computer, or click Browse to find the computer. Auditing enables you to determine which activities are occurring on your system. Through auditing, you can track access to objects, files and folders; as well as any modifications made to the objects, files and folders. Auditing enables you to collect information associated with resource access and usage on your system by allowing you to audit system logon, file access, object access, as well as any configuration changes. An audit trail can be defined as a list of audit entries which portray the life span of an object, or file and folder. When an event or action takes place that’s configured for auditing, the action or event is written to the security log. Security auditing events are written to the security log of the system, and can be accessed from Event Viewer. Computer logons and computer logoffs. Access to objects, and files and folders. Audit policies are used to define audit events on a Windows Server system. In order to track access to objects, and files and folders, you have to define and configure audit policies. A step in defining audit policies is to determine the particular event categories which should be audited. Account management: This policy tracks account management tasks performed on the computer, including creating, changing, an deleting user objects; and changing account passwords. Locate the protocol that you want to enable logging for. Right-click the Protocol Virtual Server and then select Properties. Expand the Administrative Groups node, the administrative group, the Servers node, and the specific server object. Right-click the server object and choose Properties from the shortcut menu. Select the Enable subject logging and display checkbox. Select the Enable message tracking checkbox. Specify the duration for which log files should be retained. Exchange Server extends the capabilities of Active Directory by integrating the email and mobile phone, and remote access functionality into a centralized administration and management tool. For instance, the Active Directory Users and Computers sna-in can be used for the management of user accounts and mailboxes. While Windows 2000 and Windows Server include numerous snap-ins, not all aspects of Exchange Server administration are encompassed. Therefore, the Setup program of Exchange Server registers more snap-ins when the management utilities of Exchange Server are installed. The Exchange System snap-in is used to configure an Exchange organization. The Exchange Advanced Security snap-in is utilized for implementing advanced security. The Exchange Conferencing Services snap-in is used to configure resource accounts for scheduling online conferences. The Exchange Folders snap-in is utilized to configure configuration settings for public folders. The Exchange Message Tracking Center snap-in is utilized for message tracking purposes. The Exchange System Manager uses extension snap-ins to perform its tasks. Extension snap-ins are able to extend other extensions’ functionality. To maintain configuration information, Exchange System Manager communicates with a Windows 2000 or Windows Server domain controller. The Exchange System Manager window is displayed when Exchange System Manager is started. The window contains directory information relating to the Exchange organization from the specified domain controller. Multiple Exchange System Manager windows can be simultaneously displayed. To do this, simply select the particular node, and select New Window From Here to open a new Exchange System Manager window. The Windows Server Backup utility provides a few methods that you can use to create backup jobs and execute backup jobs. You create a backup job by specifying the drives, directories and files that should be backed up, the storage medium for the backup, the time when the backup should occur, and other backup options. A backup is the process of archiving data and system files on a computer to a different location on a hard disk, or other media type. A backup plan or strategy should detail the data that has to be backed up, the manner in which the data should be backed up, the frequency at which the backups should occur, and the manner in which data restorations should occur. The backup should be implemented to restore system files and other valuable data. When determining the data that should be backed up, you should consider the organization’s needs. Mission critical data should be backed up, whereas temporary files do not possibly need to be backed up. System State data should be backed up. System State data contains the files which the operating system (OS) utilizes, such as the boot files and system files, the Registry, and COM+ Class Registration database. It also entails any additional files which Windows Server needs to restore the system. It is recommended to backup all data on a server, as well as System State data. You are then prepared for a disaster such as a hard disk failure on the server because a full backup exists to restore the server. Click Start, Programs, Accessories, System Tools, and Backup to start the Windows Server Backup utility. The Backup Or Restore Wizard guides you through the process of backing up the server, and restoring an existing backup from the hard disk or other media. You can use the Welcome page of the Backup Or Restore Wizard to open Backup in Advanced Mode. The Advanced Mode provides more features and flexibility. Clear the checkbox for Always Start In Wizard mode and select the Advanced Mode link. A number of Active Directory management and maintenance tasks can be performed using the Ntdsutil utility. You can use Ntdsutil to manage domains, and information in the Active Directory directory and log files. You can also use Ntdsutil when needing to do an authoritative restore of Active Directory. The tool is also used to manage SIDs and the master operation roles. Health of your Exchange Server system. Decreases the risk of data loss. The main reasons why Exchange databases become corrupt are listed below. Database corruption eventually results in the Exchange system being less reliable. The Exchange system is not being efficiently managed. The Exchange system is not being monitored. The size of the databases is too large to manage efficiently. The Exchange system is being shut down incorrectly. The disk subsystem is being inefficiently maintained. The databases are being manually modified. Exchange transaction logs are not being used and are simply being deleted. Online database maintenance is performed automatically by default. Online database maintenance occurs while the Exchange system is running, and includes about 60 percent of the standard operations required to maintain your Exchange databases. Tombstone Maintenance process: For deleted messages, this process deletes a deleted message from the Exchange database. Tombstone Maintenance also deletes any existing reference to a deleted message. Index Aging: Any user created views in Outlook client that have not been used for a specific time period are removed by the Index Aging process. Age Folder Tombstones: To control the size of the folder tombstone list, the AgeFolder Tombstones process removes any folder tombstone entries from the folder tombstone list which are older than 180 days. 180 days is the default setting. Message Expiration: The Message Expiration process removes messages in the public folder which are older than the predefined time setting. Update Server Versions: Server version information is used to maintain functionality between different versions of Exchange running in the enterprise. Defragmenting of the Exchange databases. Because of the nature of these database maintenance tasks, it is recommended that you perform these tasks during non-business hours. You can use the Microsoft Operations Manager (MOM) tool to automate a number of the administrative tasks needed to monitor, manage and maintain your Exchange Server environment. Monitor system resources and protocols. Report on security specific events. Perform trend analysis for system performance. Perform trend analysis for usage. You should back up System State data. If circular logging is not enabled, then you should verify that the transaction logs are deleted. Record the time period used to perform the backup job and verify that the time is in accordance with your service level agreements. Checking that the volumes on which Exchange Server is located has sufficient available free disk space. Checking the Application Log in Event Viewer for Warning error messages and Stop error messages. Event ID 700 and ID 701; shows the start time and stop time of online database defragmentation. Event ID 1206 – ID 1207; shows information on deleted item retention processing. Event ID 1221; shows the amount of free space that exists in a database. Event IDs 9531- ID 9535; shows information on deleted mailbox retention processing. Checking the size of the mailbox databases to verify that the databases’ size is acceptable and manageable. Use Exchange System Manager to check that the Offline Address List (OAL) is being generated so that remote users are able to get updated versions. If you are replicating public folder information between different Exchange Server servers, then you have to check that public folder replication is occurring as expected. Install all new service packs. Test the Uninterruple Power Supply (UPS) equipment to ensure that the Exchange Server server is protected from any unexpected power loss. Perform all required hardware changes and other important server configurations. Refresh the Exchange Server services. This would assist in freeing up valuable memory resources. Verify that the storage limits is still valid and that data storage has not yet been exceeded. Use the Microsoft Operations Manager (MOM) tool to automate a number of the administrative tasks needed to monitor, and manage and maintain your Exchange Server messaging environment. You should manage your Exchange Server environment based on server roles and responsibilities. Use the auditing capabilities of Windows Server to audit your Exchange Server environment. For troubleshooting of Exchange Server issues, use the diagnostic logging and protocol logging. If there are issues with generating the Offline Address List (OAL), then you should enable diagnostic logging and check the information in the Application log for the OAL Generator category events. You should document the configuration of your Exchange Server environment. Carefully document how you are going to restore your Exchange Server databases. You should include the back up of System State data in daily backup jobs. If you need to remotely manage Exchange Server, install the Exchange System Manager on the client computer. You should use the same Exchange Server version and service packs of the server that you are managing. Before you run any online database maintenance or offline database maintenance processes, do an offline copy of the information stores. You should steer of clear manually editing the Exchange Server databases and transaction log files. 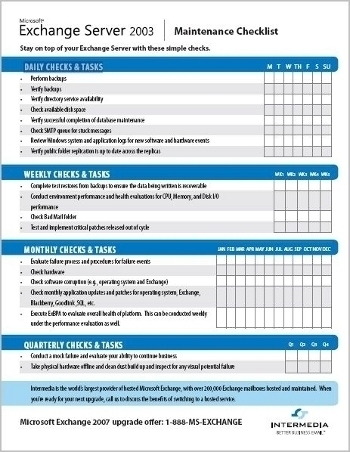 Given Health Check Template is perfect for the environment. But from where can i download the above template. 112 queries in 0.490 seconds.